Marianne Estate: Marianne Sauvignon Blanc, Cuvee L'escapade Marianne Sauvignon Blanc, Cuvee L'escapade: nbsp;The Marianne Desirade comes with a tropical nose with passion fruit and green fig. Zesty & refreshing. 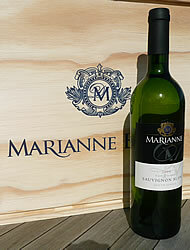 https://www.weinbaule.de/white-wine-south-africa-marianne-sauvignon-blanc-cuvee-lescapade-p-686.html?language=en&osCsid=15656092b37797309f7fc3112215456a"> Wine 12.99 6009809580069 WeinBaule.de | The Home of Wine Marianne Estate New In stock!